Drain all the Fruit Cocktail syrup from the can, Beat the cream cheese in bowl until its smooth. 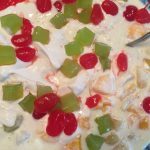 In a bowl pour condensed milk and blend in the nestle cream and cream cheese add chopped fruit. Chill before serving. Top with cherries and more fruit if you wish.